The ROLIS instrument took a snapshot of comet 67P/CG as Europe's Philae lander descended toward the surface on Nov. 12, 2014. Scientists and space fans alike held their collective breath today, as the European Rosetta mission's Philae probe landed on a comet for the first time in history. During those nerve-wracking few hours before landing, the Philae lander snapped a photo of its incoming landing site, revealing some amazing detail. The image from Philae's historic landing success is the closest view of a comet ever captured. It shows the rugged surface of the 2.5 mile-wide (4 kilometers) Comet 67P/Churyumov–Gerasimenko, currently located 317 million miles (510 million km) from Earth. The new comet photo came from Philae's ROLIS instrument, one of 10 different tools on the lander designed to study Comet 67P/C-G in extreme detail. 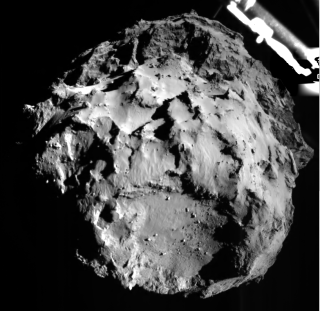 One of Philae's legs also appears in the upper right corner of the picture. Stefano Mottola of the Institute of Planetary Research at the German Aerospace Center and the lead scientist for ROLIS said in a press briefing that the image was taken about 3 km (1.8 miles) from the surface of the comet. "The landing site is exactly in the middle," said Mottola. "And so we can confirm that the trajectory was correct and we had a safe landing. And more images are to come." The Philae lander arrived at the comet aboard the Rosetta spacecraft, which left Earth in March 2004 and arrived at the comet in August 2014. The journey included a series of difficult maneuvers and a total distance of about 4 billion miles (6.4 billion km), according to ESA. The image from ROLIS is the first in what is expected to be a detailed study of the surface and subsurface of Comet 67P/Churyumov–Gerasimenko. Philae is equipped to not only photograph the comet, but drill into its surface to analyze its composition. Comets like 67P/Churyumov–Gerasimenko formed more than 4.6 billion years ago, when the solar system was young and "unfinished," according to ESA. Unlike many of the planets and moons in our solar system, which have evolved since their formation, most comets have remained the same. Thus, comets serve as a sort of time capsule from the early universe. Previous missions have chased after comets in our solar system. The International Cometary Explorer (ICE) passed through the tail of Comet Giacobini-Zinner in 1985, and then through the tail of Comet Halley in 1986. In 2005, NASA's Deep Impact mission dropped a probe onto the surface of Comet Tempel 1, creating an impact crator and kicking up debris. This allowed the second, orbiting probe to study the composition of the comet. The Deep Impact encounter is considered a "hard landing" because the object was not meant to operate after contact. In a live webcast of the Philae landing, many representatives from ESA and other space agencies expressed their excitement about the event. David Parker, Chief Executive of the UK Space Agency said, "A simple way of summing it up for me is: science fiction has become science fact today. Or maybe a better way of saying it is: Hollywood is good, but Rosetta is better."